Bishamonten is the leader of the Four Heavenly Kings, a group of Buddhist deities known in Japanese as Shitennō, who preside over the cardinal directions (north, south, east, and west). Evil is commonly believed to approach from the north, so Bishamonten is necessarily the most fearsome of the Four Heavenly Kings. Bishamonten is shown with a black face, while the protectors of the east, south, and west are depicted with green, white, and red faces, respectively. 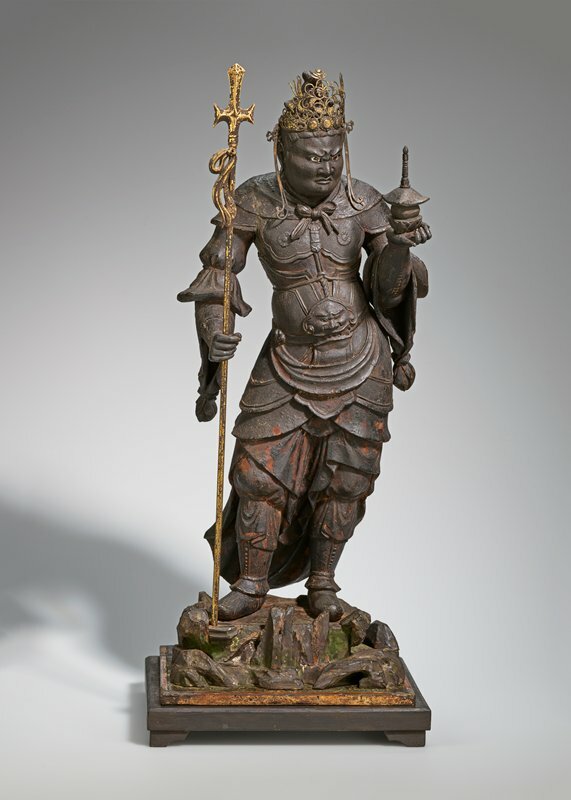 When depicted alone, he often holds in his right hand a lance and in his left a pagoda, demonstrating his role as a powerful guardian of the Buddha’s teachings.